A portable and affordable alternative to the IBM Personal Computer. What emulates an IBM Personal Computer, can easily be carried from place to place, and costs a lot less than the competition? The Compaq computer, and because it can run any major business and professional software written for the IBM PC, it looks like a sure winner. I visited the Compaq Computer Corporation’s headquarters in Houston recently to try out a prototype of its brainchild. The Physical Design The Compaq computer is designed to be portable, and although it weighs 28 pounds, it achieves that goal. To transport it, you simply secure the keyboard to the main unit by locking two sliding latches. The closed case measures 20 by 8.5 by 15.3 inches and has a built-in carrying handle. The cabinet is a plastic shell that has access panels on three sides for servicing. You can reach all of the circuit boards by removing the top panel and exposing the aluminum chassis. You can then open three main keyhole-mounted aluminum panels to reach the video display, the 120-watt power supply, the expansion slots, and the motherboard (see photo 2). The aluminum chassis, panels, and a special front panel around the video display and disk drives are elements in a design that complies with all FCC emission standards for personal computers. (In fact, an independent lab report indicates that for all frequencies tested, the Compaq was more than 10 decibels below the standard.) On each side of the computer, you’ll find a sliding door. One conceals a storage compartment for the power cord and the power switch and provides an opening for the ventilation fan (see photo 3). To plug the power cord into its standard chassis socket, you must first open the access door, which prevents the computer from overheating. The second access panel covers the expansion slots (see photo 4). Although the Compaq keyboard is the image of the IBM PC, it is actually quite different in several respects. The Compaq’s keys have a softer touch and the hardwired click is missing. You can select your own level of audible feedback for keystrokes by simultaneously pressing the ALT key and the + or – key to raise or lower the volume from no click to a loud one. The keyboard connects to the computer by a 6-foot coiled cord that is stored in a tube built into the front of the unit. Both the computer cabinet and the keyboard have recessed feet that let you elevate the unit to a five-degree angle. You can also angle the video display five degrees. Disk Drives The Compaq uses Control Data Corporation 5-1/4-inch floppy-disk drives because they have three major advantages. First, they are much quieter than the IBM PC’s single-sided Tandon drives. Second, when you turn the Compaq off, the two read/write heads remain unloaded, so they won’t touch each other. For a portable computer, that’s an important feature because it eliminates the possibility of the heads damaging each other in transit. While the company recommends that you insert a cardboard retainer when you transport the unit, the designers assume that most people would forget or wouldn’t be able to find the cardboard when they wanted to move the computer. To offer additional protection, the drives are shock mounted. The third advantage of these drives is their storage capacity. Each double-sided disk drive holds 320K bytes of programs or data. You can still read standard IBM disks with the Compaq, but you also have the option of formatting user disks for twice as much storage as the standard IBM PC offers. Unlike the IBM machine, the Compaq does not have a disk-drive expansion connector from the disk-interface board, but you can plug an IBM floppy-disk controller board into one of the expansion slots and add two additional drives. Finally, the Compaq, in another variation from the IBM PC, does not have a cassette interface; the Compaq’s disk drive is a standard feature, so its designers chose not to include one. Memory Capacity The Compaq comes with 128K bytes of RAM (random-access read/write memory) soldered in to increase reliability. You can expand to 256K bytes of RAM on the motherboard. By comparison, the IBM PC comes with 16K bytes of RAM and can expand to 64K bytes on the motherboard. The design of the Compaq motherboard gives you access to the additional memory-chip sockets without requiring you to remove the board. The large amount of RAM in the Compaq enabled its designers to omit the cassette BASIC interpreter in ROM (read-only memory), one of the IBM PC’s features. With 128K bytes of RAM on the Compaq, you can use BASICA (Advanced Disk BASIC on the DOS disk) without sacrificing RAM memory space needed for programs. Monochrome and Graphics The Compaq improves upon the design of the IBM PC by consolidating monochrome and color graphics into one board. Hence you get the best of both worlds in one monitor display. Internally, the software always recognizes the color-graphics board and acts accordingly. When you specify the 80- by 25-line mode, however, the hardware switches to the character set of the monochrome board. The available character sets are identical to those on the IBM PC, and the Compaq has both RGB (red-green-blue) and composite-video outputs as well as an RF (radio-frequency) modulator output so that you can connect the computer to-your television. Ultimate Compatibility When a company advertises a computer as being “IBM PC-compatible,” the best way to test its claim is to try to load an IBM release of PC-DOS, CP/M-86, or the UCSD p-system. I didn’t have the p-system, but I did have both PC-DOS and CP/M-86 and was able to try both of them on a prototype of the Compaq computer. 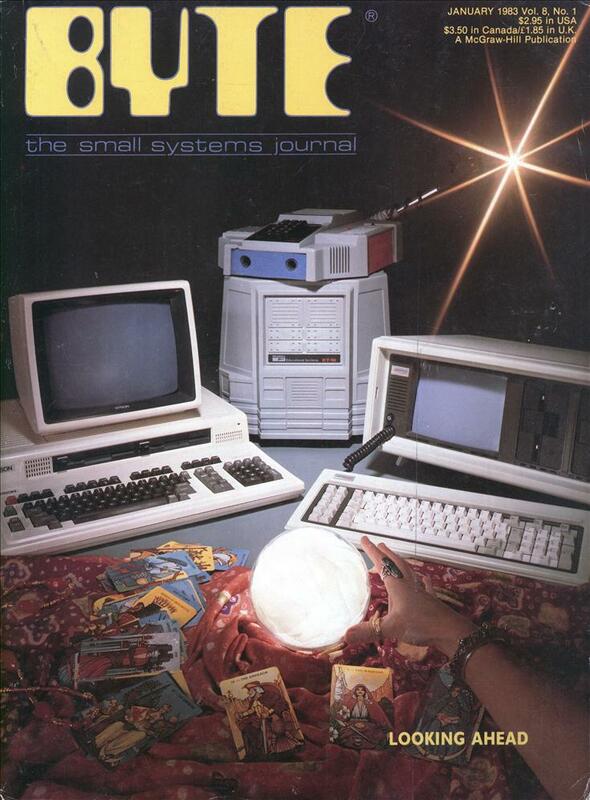 The systems loaded and executed perfectly, with the exception of the BASIC on PC-DOS, which wouldn’t execute because the Compaq doesn’t have ROM BASIC. The BASICA provided on disk and all of the IBM PC sample BASIC programs found on the PC-DOS disk ran without incident. I also tried some CP/M-86 assembler-level software that I had written, and it worked without a hitch as well. I spent about an hour loading and running a number of game programs and some professional packages such as Wordstar and Supercalc. With one exception, they all worked correctly. The one that didn’t was a game program that ran perfectly but died when I tried to terminate the game. One of the programmers told me that the problem was probably a result of not initializing the hardware correctly when the system was powered up. The company assured me that the problem would be solved before any machines were shipped. Other Features Several special features deserve mention. Instead of providing a connector for external disk drives, the Compaq has a parallel printer-port connector that is fully supported by all system software. In addition, the Compaq has been designed to handle 128K-bit RAM memory components as soon as they become commercially available. Many features of this computer indicate that the designers anticipated possible problems and solved them before the Compaq was announced. A case in point is the keyboard cable, which is designed to supply 12 volts instead of 5 to the keyboard, thus preventing the voltage from dropping to marginal levels at the end of its 6-foot cord. In another anticipatory design feature, the RGB monitor interface has internal jumpers that allow reverse-signal polarity for some nonstandard RGB monitors. Documentation I can only assume that the same level of quality that is characteristic of the Compaq computer will be found in the documentation. The company was preparing the user’s manual when I looked at the Compaq, but the typeset text and numerous diagrams and tables I saw looked quite professional. The Bottom Line Considering all of the ways in which the Compaq improves on the IBM PC, the most significant difference between the two is price. An IBM PC with one double-sided drive (320K bytes), both the monochrome and color-graphics boards, a parallel-printer port, a monochrome monitor, and 128K bytes of RAM would cost approximately $3735. All of these features are standard on the Compaq for $2995. With this configuration, you would have only one remaining expansion slot on the IBM PC, while three slots would be available on the Compaq. All of the options are also less expensive with the Compaq. 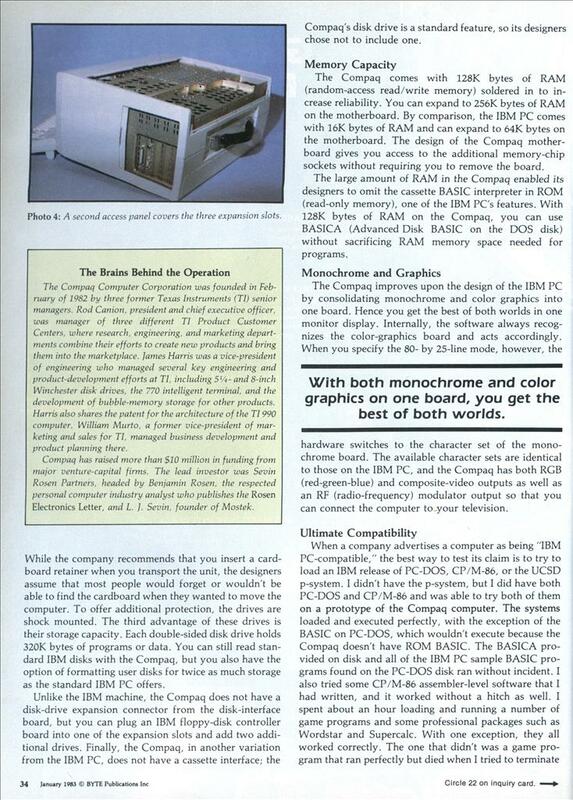 For example, an additional double-sided drive for the IBM PC would cost $650 in contrast to the $595 for the Compaq. A 64K-byte memory board costs $195 for the Compaq versus $350 for the IBM, and a serial-interface card for the Compaq costs $145, while its IBM counterpart is $150. Conclusions The Compaq computer has everything going for itâ€”design, compatability, portability, and price. The only possible obstacle Compaq faces is IBM itself. IBM has a longstanding reputation for deliberately designing hardware and software that render plug-compatible products incompatible. Barring that occurrence, Compaq should do well by introducing a comparatively low-cost and portable alternative to the IBM PC. Wow, that is an actual review about a computer. They even opened it up. There is a rumour from about that time that some software checked for the string IBM in a part of the BIOS ROM. Of course Compaq couldn’t just write IBM in there. So they used the german word SCHREIBMASCHINE (typewriter) there to fool those software packages. Where are the gaming benchmarks? Wasn’t frogger playable on one of these? I don’t know about frogger, but there used to be a game called Classic Star Trek that could be played on a Compaq. The Compaq really was portable. Then again, so is a load of bricks, if you own a wheelbarrow. I had one of these back in the day. We called them luggables. I used to lug this around airports worldwide and after a couple of trips you not only built up your arm muscles you developed a bad back. They did work and were revolutionary because you could take your computer where you needed it. It’s a pretty nice machine, considering its age. Wow, this brings the nostalgia. I was in preschool when my father’s company first loaned him one of these boxen (to what end, I forget). I remember mainly learning just enough DOS commands to launch the little side-scrolling dogfight game he got from some friend or other — cd \ ; cd games; cd fighter; fighter. Apparently at four, I didn’t realize you could string paths together with suitable slashes. Thanks for the interesting story! I recall trying to carry one of those for 500 yards in 1986 (in Ireland). I’m not a weak man, but before long I genuinely thought I would injure my arms. We had these available for checkout. They set a minimum height requirement to check one out because short people dragged the keyboard and scuffed it up. When the problems with that policy were pointed out they started checking out a luggage cart with the computer.